65WATT COMPACT 10K STRAIGHT PIN BULB 65 Watt 21' 10,000K Compact Fluorescent Lamp Straight Pin Base 24WATT COMPACT FLO 10000K STRAIGHT PIN BULB 13' High Intensity Purified Super Daylight The 10,000K is purified super daylight lamp that simulates the high intensity lumen output of the midday tropical sun. It contains rare earth color enhancing phosphors to emit sparkling, blue white rays. Compact fluorescent lamps emits powerful lumen output without consuming high energy or producing excessive heat. They provide photo biological light requirements for aquatic life and enhance the appearance of the aquarium. The lamps come in two styles European straight pin base arrangement and japanese square pine base arrangement. SIZE 13 INCH DIMENSIONS L13 X W1.13 X H2 18WATT COMPACT FLO 10000K STRAIGHT PIN BULB The 10,000K is purified super daylight lamp that simulates the high intensity lumen output of the midday tropical sun. It contains rare earth color enhancing phosphors to emit sparkling, blue white rays. 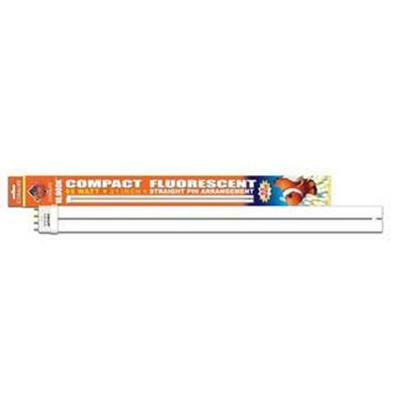 Compact fluorescent lamps emits powerful lumen output without consuming high energy or producing excessive heat. They provide photo biological light requirements for aquatic life and enhance the appearance of the aquarium. The lamps come in two styles European straight pin base arrangement and japanese square pine base arrangement.